Winemaker Pascal Madevon had not made white wines for about 20 years when he joined Culmina Family Estate Winery in 2013. There, in addition to several excellent reds, he began making acclaimed whites from Chardonnay, Riesling and Grüner Veltliner. 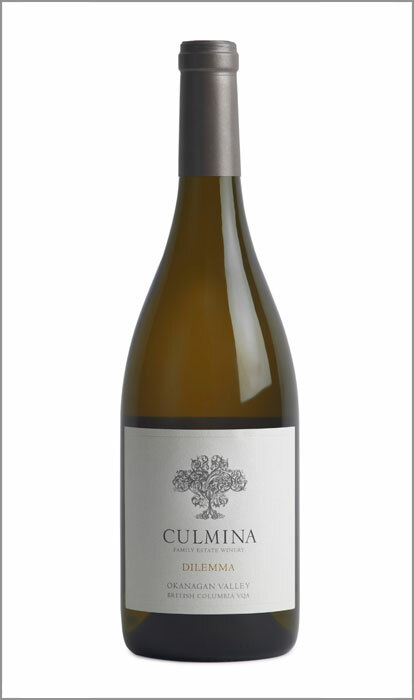 The most recent release from Culmina is the Dilemma 2014, a very elegant Chardonnay which is reviewed below. All of this white winemaking speaks well for Pascal’s latest career move. He has just launched Pascal Madevon Signature Ltd., a wine consultancy, with Culmina as his first client. His news release says that the consultancy will advise Canadian wineries regarding terroir, vineyard management, winemaking, and the marketing of red, white, and rosé wines. "The potential, the spirit of a wine emerges from its terroir, but there is also an important human element that drives a wine's final creation," Pascal said in the release. "I am eager to work with passionate proprietors and winemakers who, like me, are looking to unleash the true signature of each and every wine." Trained in France, Pascal came to the Okanagan in 2001 as the initial winemaker for Osoyoos Larose Winery. He was impressed by the quality of the grapes the terroir produces, so much so that he has become a Canadian citizen, underlining his commitment to Canadian wines. Before Groupe Taillan (owner of Osoyoos Larose) sent Pascal to Canada in 2001, he briefly managed Château La Tour-Carnet [a fourth growth]. Before that, he spent 11 years at Château La Tour-Blanche, a cru bourgeois of Médoc. Before that, he worked at Château Laffitte-Carcasset in Saint-Estèphe. He was born in Paris in 1963. He decided to take up studies in agriculture after specializing in mathematics in high school. He also found time to write two books. One is a hardcover called Le Livre du Vin. The other, Les Vins de France, is a paperback, of which 25,000 copies were sold. Pascal’s attention to detail has always been remarkable. The entire Osoyoos Larose vineyard, about 70 acres, was laid out on his computer in small blocks that reflected the soils and the productivity of the vines. The image looked much like a crossword puzzle. He also made it a practice to take photographs regularly in the vineyard, not only to monitor its progress over the season but to compare the vineyard from year to year. When he took over the vineyard at Culmina, it was already laid out in computerized detail. It may be one of the most technical vineyards in the Okanagan. And there is no doubt of his winemaking ability. Here is a note on the Culmina release. Culmina Dilemma 2014 ($34). This is an elegant and restrained Chardonnay. It beings with aromas of citrus. On the palate, the fruit flavours are pristine, with notes of lemon and orange framed by subtle toasty oak. There is a hint of spice on the finish. The texture is rich with fresh acidity to give the wine ability to age. 94.